Van Peperstraten Group presents Greenpoint® – a complete concept that is 100% sustainable. 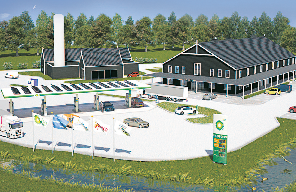 We develop carbon neutral complexes paired with sustainable gas stations that offer renewable fuels at prime logistical locations throughout the Netherlands. For every Greenpoint® location, we make an assessment of local opportunities and demands. We do so in close cooperation with the authorities, developers, businesses and citizens. As a result, each location will have a unique combination of facilities, such as a hotel, restaurant, casino or truck stop cafe. While every Greenpoint® is different, they all share the same basic principle – full sustainability. Solar panels on the rooftop of a future storage shed generate energy. Rain water is cleverly collected, purified and stored in an underground basin. All electrical equipment at a Greenpoint runs on solar power, from shops to restaurants and charging stations for electric cars. Hydrogen buffers are suitable for storage of electricity. For example, wind farm operators could store energy and save it for peak energy demands. Electricity splits water molecules into hydrogen and oxygen. In an internal combustion engine the reaction of hydrogen and oxygen releases water and energy – clean substances that don’t harm the environment. Hydrogen provides electricity for electric motors or fuel for combustion engines. The provinces of South Holland and Zeeland and the municipalities of Goeree-Overflakkee and Schouwen-Duivenland are exploring the possibilities for a tidal power station. Such a station would provide sufficient renewable energy for all households on both islands. Hydrogen would be an excellent option for temporary storage of renewable energy here as well. Where can you find Greenpoint®? 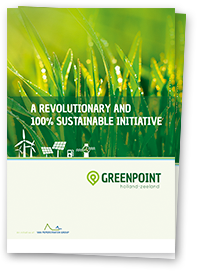 Due to Greenpoint®’s roaring success, this groundbreaking sustainable initiative is up and running or in progress at various locations in the Netherlands. Please refer to the interactive map to the left for more information on these locations. In the meantime, Van Peperstraten Group is searching for suitable Greenpoint locations throughout the Netherlands. Extensive research on traffic flows shows the ideal location for a Greenpoint® combines a steady freight traffic flow with the vicinity of large neighborhoods and cities. Making renewable fuels available at these busy hubs allows traffic in and around cities to become more sustainable. In cooperation with local authorities, a custom made development plan will be created. Do you see possibilities for a Greenpoint® in your city? Please contact us.